Use: The Header/Footer Pattern Legend item is used to display user-selected keywords and patterns in a table-style legend in the log's header or footer. You build the legend by selecting the keywords to be displayed, with editing options to change how the labels and pattern are displayed in the legend. Note that the patterns are linked to the current Pattern Table, they are not embedded statically into the design. If you change a pattern's design in the Pattern Table, or if you have selected a different Pattern Table as default, the appearance of the patterns in the legend will change. Note that once the keyword and pattern are inserted into the legend, there is no further link to the Keyword table. Any changes made there would need to be manually done in the legend as well. See the Pattern item if you want to insert individual pattern blocks. 1. Access the Log Designer program pane. 3. Click on the Pattern Legend button in the Log Designer tool pane. The pointer will change shape to "+" for marking the legend position on the design screen. 4. Place the cursor at the intended location in the header or footer for the upper-left corner of the legend block and click and hold the left mouse button. Keep the mouse button down as you drag down and to the right, drawing a rectangular area within which the legend will be placed. The program will display the Legend setup window. Title: Type here a title for the legend, such as "Pattern Legend" or "Lithology Legend". Use the Font button to access font settings (type, size, formatting), and use the color box to select the title color. Position: These coordinates determine the placement of the edges of the legend block in the header or footer of the log. The X coordinate represents the horizontal (left to right) placement, and the Y coordinate the vertical placement in decimal inches or centimeters relative to the top of the header or footer. The defaults reflect the location where the block was drawn (step 4 above). You may change the legend placement by editing these values, or (easier) by moving/resizing the block itself on the design screen. Margin: These settings define the margins, in decimal inches or centimeters, inside the perimeter. Appearance: Use these options to arrange the pattern blocks and text within the legend. Column Margin: This represents the horizontal distance between the columns - the pattern box and the labels, and the labels and the next pattern block; the greater the distance, the more spread out the columns will be. Row Height: This setting determines the overall size of the pattern blocks. LogPlot will maintain a rectangular shape to the blocks, as you increase the height then the width will increase proportionally. Row Margin: This represents the vertical distance between the rows. The greater the distance, the more spread out the rows will be. Font: Use this button to define the font style and size for the keyword labels in the legend. Color: Use this button to choose the font color for the keyword labels. Pattern Items: This is the pane where you will list the keywords and their patterns to be displayed in the legend. + Click this button to display the Lithology Selector window. Here you can locate the keyword-pattern to be listed; click on it to highlight the keyword and click the Select button to select it. (See the Lithology Selector window for more details.) You can list as many items as you like. - Use this button to remove the currently-highlighted item from the listing.
! 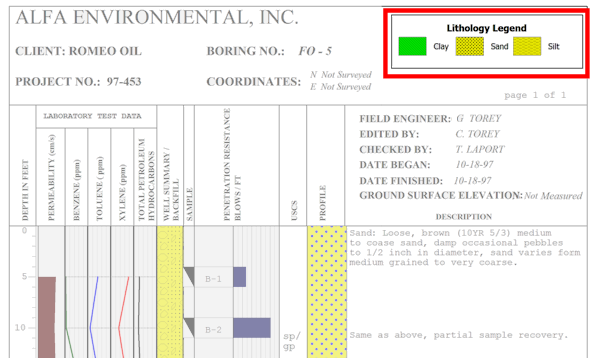 IMPORTANT: There is no further linkage between the patterns and labels shown in the listing and the Lithology Selector. This means that any changes you may later make to your Keyword file - such as changing the keyword text or choosing a different pattern for them - will not be reflected in the legend. You'll need to update the legend manually. ^ Use the up-arrow button to move the currently-highlighted item upwards in the listing. v Use the down-arrow button to move the currently-highlighted item downward in the listing. Labels: Double-click on a text item to highlight it, and type in the desired text. Patterns: Double-click in a pattern block to display the Select Pat tern window. Select the design, density, colors, and ilne thickness for the pattern. Outline: Check this box to display a line around the border of the legend. Color: Click here to choose the line color for the border. Fill: Check this box to fill the legend background with the color you choose to the right. 6. To accept the displayed information, click the Apply button at the bottom of the options window. You will see the pattern legend placed in the header or footer in the design window. You may continue to adjust the settings if necessary, remember to click Apply any time you want your changes applied. 7. To close the Pattern Legend options window, click the Close button. See: Move or Resize Header/Footer Items for information about dragging, resizing, and aligning items. * Double-click on the pattern legend item in the design pane. * Or, right-click on the item and select Edit Item. * Or, double-click on the Pattern Legend item in the Items View pane at the bottom of the design window.